Learn how to make a moving robot using a solar panel and a motor. Watch it walk on a sunny day. No batteries are required. 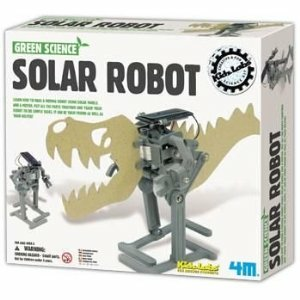 Recycle everyday materials as its body parts, this green powered robot can be transformed into a Dinosaur Robot or a Monster Robot, what have you. Also required, but not included in this kit: Small Crosshead (Phillips Head) Screwdriver, 1 Empty Paper or Foam Cup & 2 Plastic Forks.